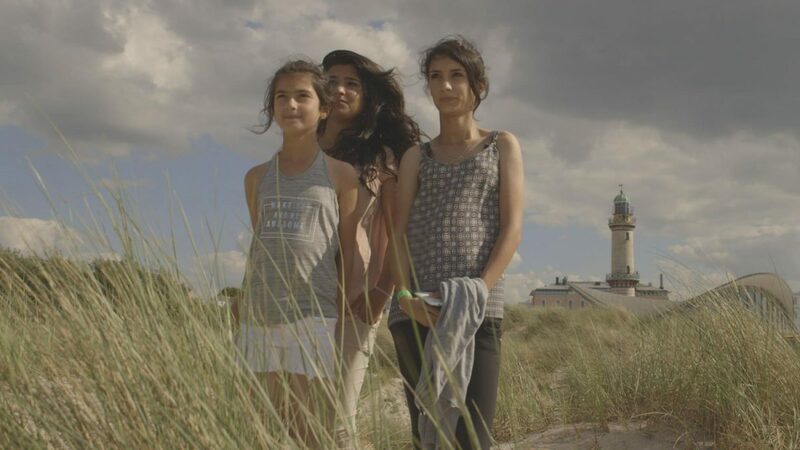 One of the strongest films in the Santa Barbara International Film Festival’s new Crossing Borders sidebar is Sky & Ground, an intimate documentary about a Kurdish Syrian refugee family’s plight to leave Greece and cross seven countries to reach relative freedom in Germany. The viewer is taken on the dangerous refugee route with a family that’s surprisingly upbeat and cheery, despite the upheaval from their homeland. There’s action, tension, drama, and uplifting messages of new life. How did this film come about? This film was part of a series of films titled Humanity on the Move. It focused on telling stories of families forced to flee their homes because of violence and instability. We were following up on the social-impact projects that our company, Show of Force, had produced previously, including Half the Sky and A Path Appears. I remember reading in late 2015 that it was the most violent year on record, with the most conflicts spread out across the globe. Because of this, they were anticipating a record number of displaced persons. We began filming this project shortly after the death of 3-year-old Aylan Kurdi on the shores of Greece. I had been reading about Idomeni as a place where thousands of people were stuck and being held at the border, desperate to enter Europe through Macedonia. We contacted a local producer whom we sent to scout the camp, and she came back with a very compelling interview from Guevara Nabi, explaining how his family had fled violence in Aleppo, Syria, and smuggled themselves through Turkey to Greece. The Nabi family was incredibly warm and compelling — a three-generation family that was sticking together despite horrible conditions in the camp and on the road. Guevara was also filming their journey, and was more than happy to have us accompany them. I sent out my fellow director/producer, Tayla Tibbon, and she confirmed they were indeed ready to film with us, and were getting ready to make the journey to Berlin. We felt we had a unique way to tell the story of so many thousands of families traveling across Europe, through the experiences of the Nabi clan, who were also leaving at the most challenging moment in Europe, when sentiment was turning against refugees and borders were closing left and right. Talya and our director of photography, Axel Baumann, embedded with them over several months as they made their way across Europe, capturing almost every hour of their 3,000-kilometer journey, and negotiating incredibly difficult circumstances at every turn. Why did you decide to focus on the plight of refugees? We felt that we were in an unprecedented moment in the world — tens of millions of people were being forced from their homes across the world, from Syria to Africa. We felt there weren’t stories being told from the perspective of people in the midst of these journeys and wanted to bring a verité, fly-on-the-wall approach to really do our best to get out of the way as filmmakers and create a platform where their experiences and their voice could drive the storytelling. We also felt that what was being lost in the political conversations were just how similar so many of these people were to ourselves. They were families who had strong bonds of love and loyalty, who laughed together and cried together and had their histories, their stories and their jokes and ways of being, just like ourselves. We wanted Sky & Ground and our other films to stand out as films that were not trying to prescribe policy or political solutions but rather inviting viewers into compelling families and journeys where they could hopefully empathize and see themselves in the journey. Was it hard to have the family grant you this level of intimate access? It was incredibly difficult, and Talya and Axel did amazing work, gaining their friendship and trust and being committed to telling their story in a way that was fair and balanced. We also made a conscious decision that we would do everything in our power to not alter the outcome of their journey. This was important to Guevara and the Nabi family as well: They wanted people to see the reality of what so many thousands of people were facing; they did not want our film team to offer ways out, or to influence their journey. We also had to be mindful of following international law and never breaking laws by offering any assistance which could be seen as us smuggling them. Did you fear that you put the family in danger of being caught while filming? This was a constant fear, however we were always incredibly cautious about being low profile, and giving them plenty of space for any particularly sensitive segments of the journey. It was also a constant conversation that Talya and Guevara maintained. And once again, Talya and Axel were fantastic about being close and with them for the journey, but always being hyper-aware of any threat their presence posed, and avoiding any additional risk they might face. Were you in any danger yourself, aka doing anything illegal in regard to aiding them? Talya and Axel were very mindful of never crossing a line where they could be seen as “smuggling” or aiding the family in any way. This was just a few months after the Hungarian camera operator had kicked a refugee, so police and authorities were cracking down on camera people, and there was often risks of Talya and Axel being captured or arrested by police and charged with smuggling or other illegal activities. Did the Nabi family do some of the filming themselves? Guevara Nabi had been filming his family for a few years before we arrived, and he and his nieces continued to film their journey when our cameras were not present. This helped us to always have coverage of their journey, during the moments when it was too risky for Talya and Axel to be present. Talya had the great idea of upgrading Guevara’s camera to a very small HD digital camera that helped improve the quality of their footage while staying small and discreet. How is the family integrating now? The family is slowing integrating into Germany. The teenagers are doing the best, especially Heba and Lalya — they are back in school and considering different professional career tracks. The family is learning German, but it’s harder for the parents — it’s taking them longer to be settled and feel like they can start new lives in Germany. Any other anecdotes from the production of the film? The Nabi family watched the film together prior to our first public screening, and they loved the film. They laughed and cried and recalled much of the journey. That was incredible rewarding for all of us to hear. We hope this film continues to engage and promote discussion and hopefully, more support for refugees and displaced people everywhere.